Euclid High School hosted the first annual Martin Luther King Jr. Showcase on Monday and featured three competitive varsity contests. Each game was decided by single digits, including a near comeback victory from the home team. See the results below and check out a few of the top performers! Michael Bothwell (Cornerstone Christian) 6'3 Jr., CG - It appeared that Revere had a wide open layup that would give them a slight edge late in the fourth quarter, but Bothwell recovered and blocked the shot on the glass. An improved athlete from a year ago, Bothwell is a three-level scorer and he put that on display Monday afternoon as he used his size to get into the lane and absorb contact. His 30 points was the high mark for all three games of the day but just another night in the office for the 6'3 junior. 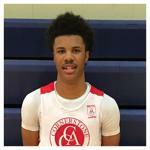 Garvin Clarke (Euclid) 6'0 Fr., PG - Clarke has been bar none the most productive freshman in the area so far this season. One thing that can't be taught is composure and for someone in only his first season of varsity basketball, Clarke's poise is unmatched. His play in the third quarter sparked an Euclid run that helped dig the Panthers out of a pretty deep halftime hole. Normally not a great shooter, Clarke connected on a pair of triples in the third and his anticipation and motor on the defensive end sparked the Panthers late run. He finished with a game-high 22 points and pulled down 7 rebounds. D.J. Dial (Brush) 5'9 So., PG - Dial's game-high 19 points was enough to push the Arcs passed a scrappy Warrensville group. The sophomore has a smooth 15-18 feet pullup jumper and there might not be anyone in the area who is quicker with the basketball. Dial has increased his scoring output from a year ago and both he and Brush are beginning to find their identity moving forward. Brandon McQueen (Cornerstone Christian) 6'1 Sr., CG -Nowadays, it's easy to find a talented player or an athletic prospect with a solid upside, but it is difficult to find a guy who possesses the qualities fit for a leader. McQueen offers both. Whether he's on the floor or on the bench, the senior guard's voice can be heard throughout the gym while he encourages and directs his teammates. McQueen plays the game unselfishly but is capable of scoring the rock when his number is called. His first step and long stride when attacking the basket allowed him to attack the rim and finish with a few crafty finishes. Justin Motley (Lutheran East) 6'7 Sr., C - While his scoring numbers won't jump off the charts, Motley does a lot of things that won't show up in the box score. Motley's size and length allowed Coach Jones to put him in the middle of the 1-3-1 zone and his ability to block shots allowed him to anchor the Falcons defense. He finished the night with 6 points, 12 rebounds, and 6 blocks. As Lutheran East continues their gauntlet of a schedule, Motley's play on the defensive end of the floor will be key. Pete Nance (Revere) 6'8 Jr., PF - Nance didn't have his best night offensively but at 6'8, his size was too much for Cornerstone down the stretch. His lack of scoring didn't affect his ability to block and alter shots on the other end as he finished with 5 blocks on the night. Nearly half of his 17 rebounds came on the offensive glass and his putbacks resulted in a number of lead changes down the stretch. Joe Boyer (Revere) 5'9 Jr., PG - Boyer played a key part in the Minutemen's late push against CCA. The lefty guard had a strong second half and dished out a few late assists. He finished wth 15 points and five assists. Keandre Graves (Lutheran East) 6'3 Jr., WG - Graves has really started to come alive during his junior season. A more consistent finisher through contact, he has become a slasher who can step out and give you an open jumper. Jordan Burge (Lutheran East) 6'2 Jr., WG - Burge is a physical guard who isn't afraid to get his hands dirty in the paint. All night, he gave the Falcons extra opportunites on the offensive glass en route to a 13 point, 11 rebound double-double. Emari Baddour (Eucld) 6'2 Jr., WG - While it was Clarke who carried the slack to open the second half, it was Baddour who picked up the slack late. The junior connected on back to back trnasition baskets to close the third and give the Panthers their first lead of the game after trailing by 18 at the break.